Ballard, a Seattle neighborhood, has its share of great music venues including The Sunset Tavern. It is cozy, has an ample sound system, and hosts a variety of quality local and touring acts throughout the week. On this October weekend, we enjoyed a night of country and folk music, and even a little country punk. Star Anna and Kasey Anderson with Star’s former Laughing Dog Ty Bailie on organ were up next. Kasey and Star took turns playing their new acoustic numbers and backing each other on several of them. She also covered an Elvis song called “Power of My Love”. I wrote about Star Anna several times (see previous review here). She brings something new to each show. Star has a haunting voice that grabs the audience. I love watching people who walk into her show late and slowly make their way to the front to watch her; their reactions go from curious to jaw-dropping disbelief at her amazing voice. She seems shy and humble, almost apologetic at times–like she’s embarrassed of her immense talent or heartfelt, soul-spilling songs. I looked forward to Kasey Anderson, too. I came in late to a show at The Tractor one time, and just caught a couple of songs from his set. I liked his gritty, bluesy growl, and the energy he brought to the stage. I wasn’t able to see him again until this night. Although he had more breathy and subdued vocals for this acoustic set, I enjoyed his new songs and also purchased one of his current CDs, Heart of a Dog after the show. Star and Kasey played summer and fall gigs up and down the coast, and recently recorded a live session in Montana. 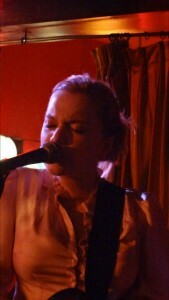 Star also played Bumbershoot and the Americana Music Awards in Nashville. 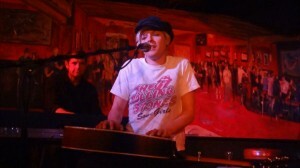 Kasey’s song, “Like Teenage Gravity” was featured on a recent Counting Crows album, and he and his band The Honkies toured with them. Kasey Anderson will play New York on October 20. Check their websites for show details and more music. I’m always hesitant to hear new music. I tend to get into a musical rut and refuse to try new things. I was going to leave after Star and Kasey’s set, but someone in the audience convinced us to stay for Lydia Loveless and described her music as country punk. That sounded interesting. We were glad we stayed; Lydia Loveless was exactly that blend of two very different genres. She has a crisp and pure country voice, and has been compared to the old souls of country; but I think there is a hint of Belinda Carlisle, too. With some songs, she has the speed of a punk rocker. She donned a Telecaster, with Parker on drums and Ben Lamb on upright bass. Lamb head-banged to the songs and switched off between bowing and slapping that bass. Loveless is from Ohio and is finishing up a 7,000-mile tour all over the US. She will also head across The Pond to the UK in November.